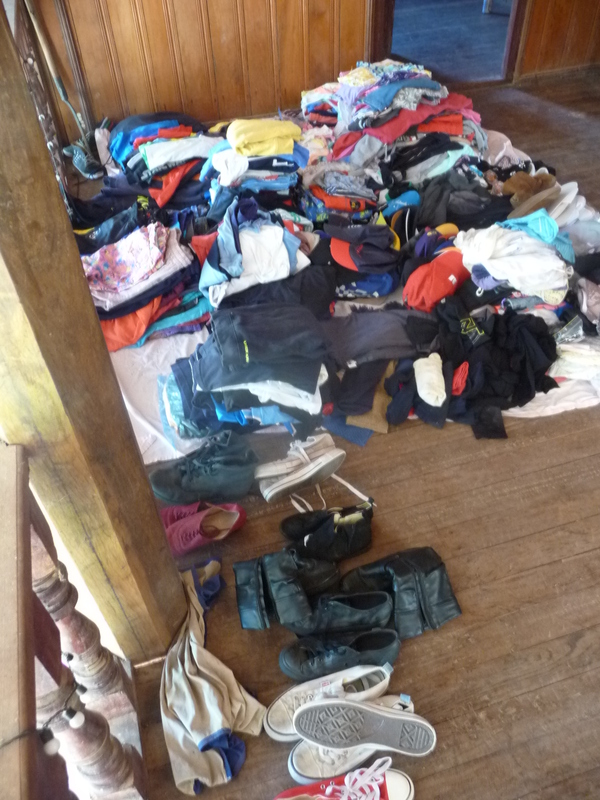 There are, at the moment 70 photos with their notes and stories. Today some photos will be VERY similar to others – that is so that our Wagga friends can select and save whatever they like. 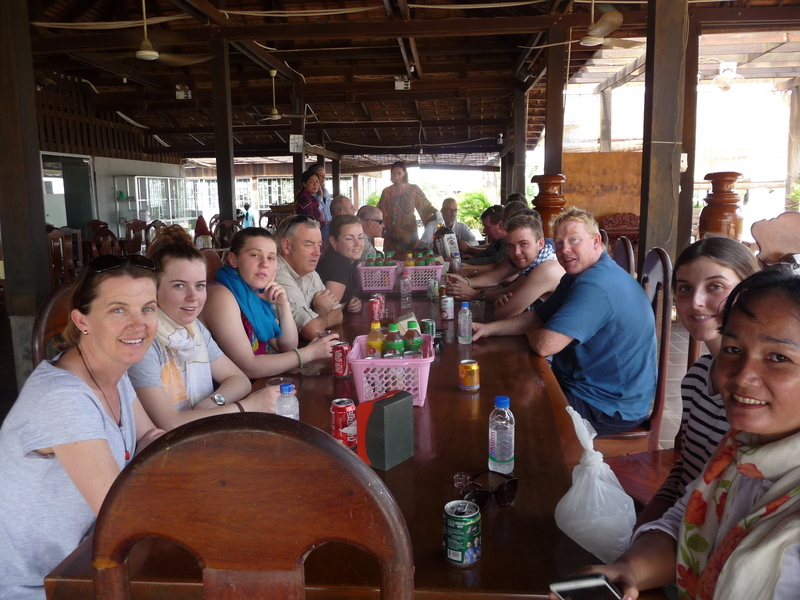 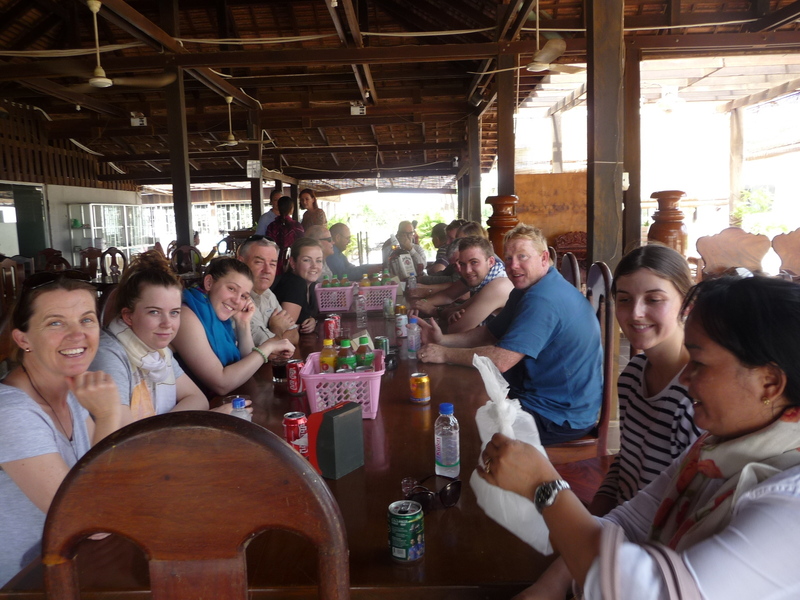 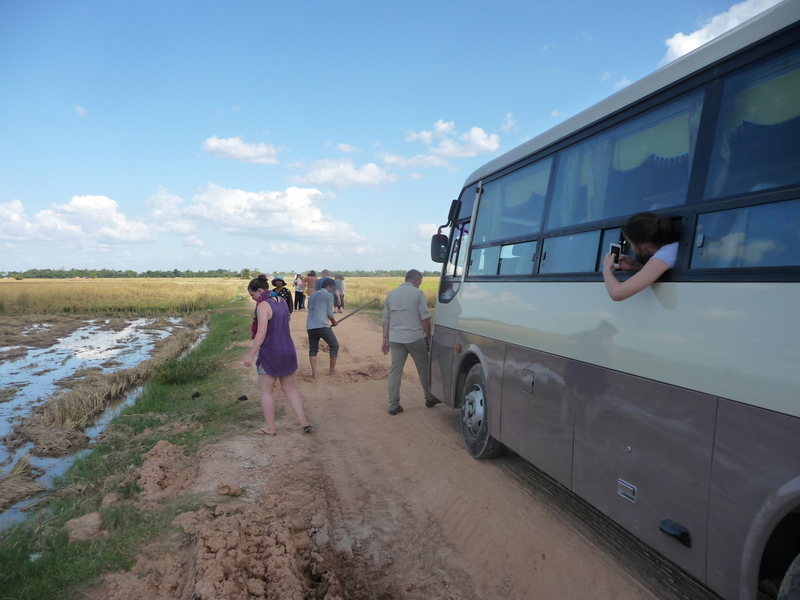 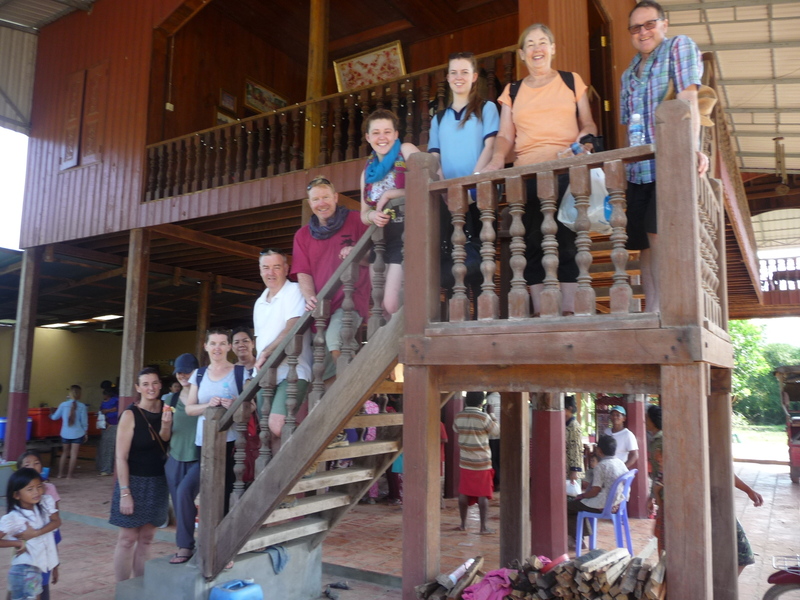 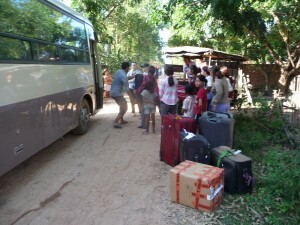 A group of 18 plus their Khmer guide, Sreymom, and Chanthou and Chanthou’s friend Trob travelled through four hours of mud ina 35 seater bus and four 1200cc Harley Davidsons to Chuor Ph’av village. 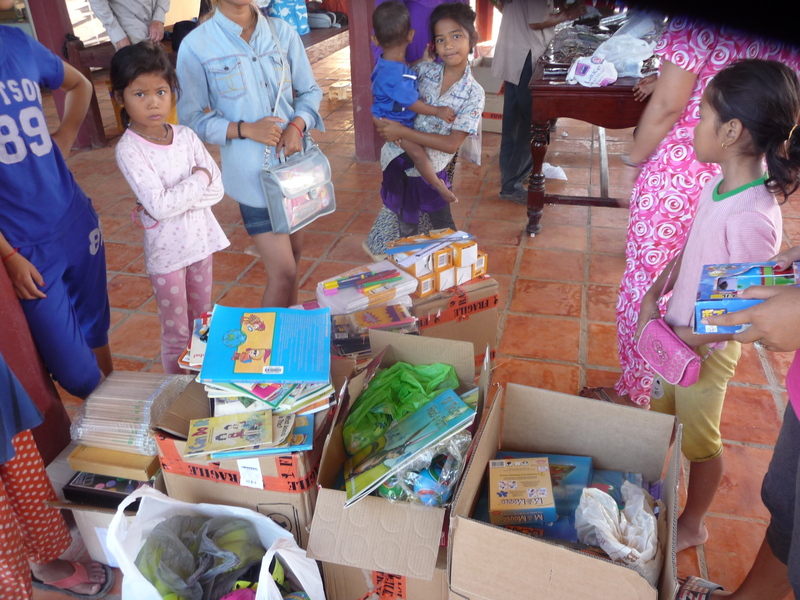 On their bus was also an enormous amount of clothing and toy donations together with lots of cartons of school books, glasses, and a sack of infusion equipment (medical). 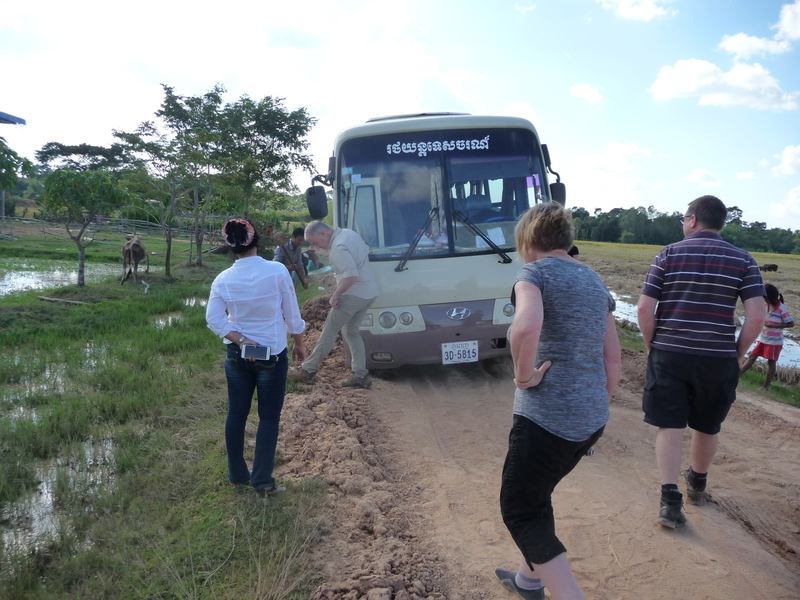 There was no way that the bus was going to make it past our front gate so to the rescue came our wonderful ever useful tuk tuk. 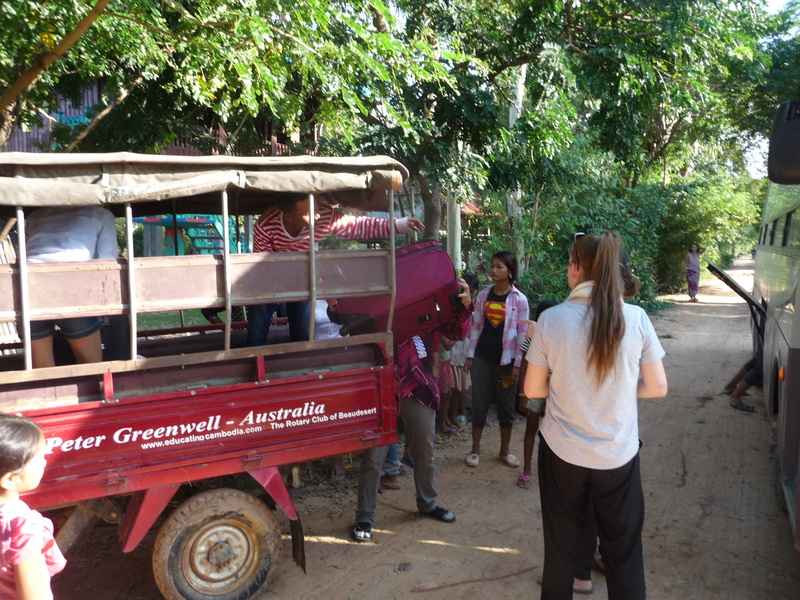 We took the seats out to load all the luggage through the mud for the last few metres inside.. AND THEN we put the seats back in and packed the tuk tuk twice with all the people for the trip to the SCHOOL. 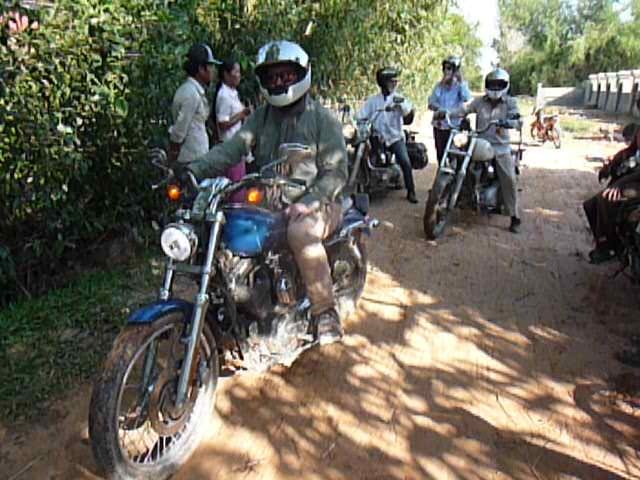 The four Harleys all played taxi back and forth to the school as well.. (indeed later in the day and in the early morning both the tuk tuk and the Harleys ferried people for a look round the village. 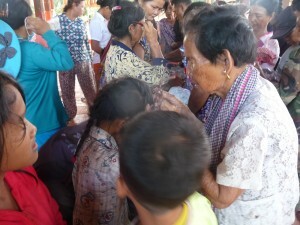 – I took these three photos earlier and they show the need that is written about in the September blog below this one. 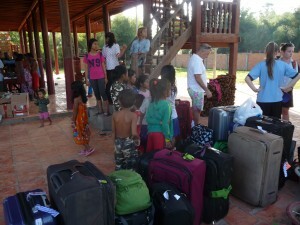 – We have 9 classrooms and 1340 children. 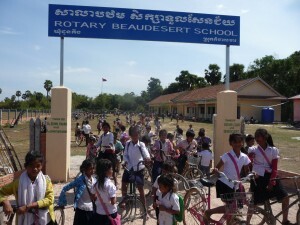 We are in serious need of three extra classrooms ie one building. 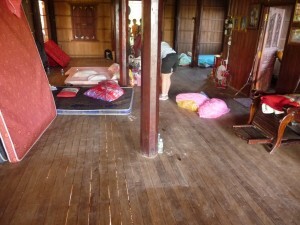 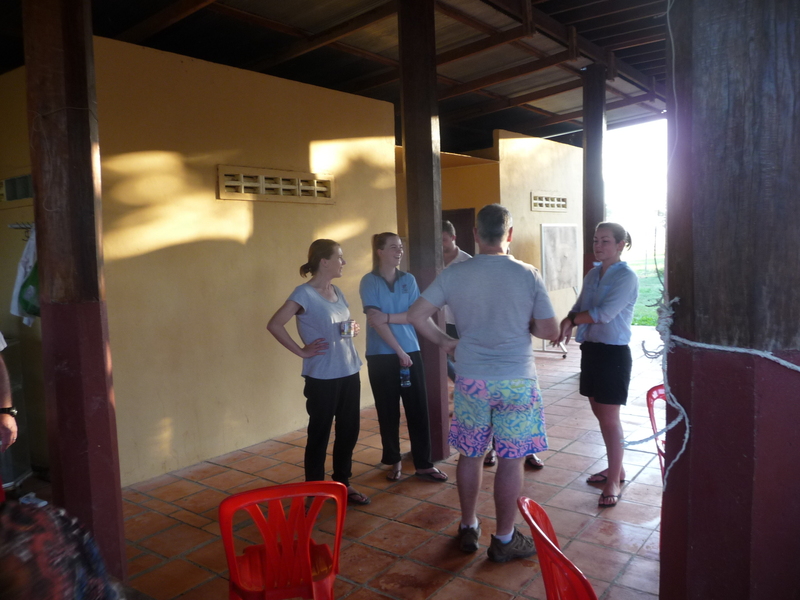 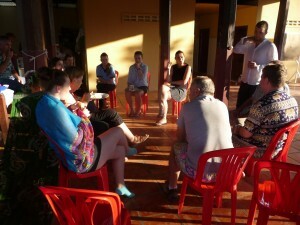 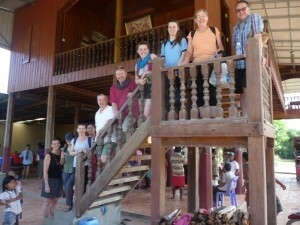 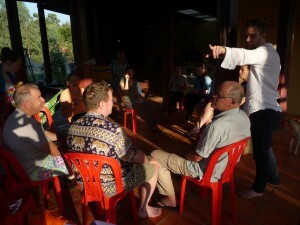 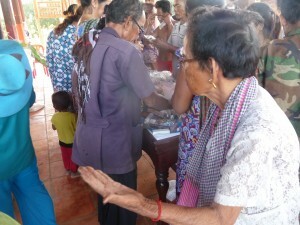 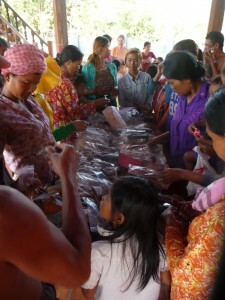 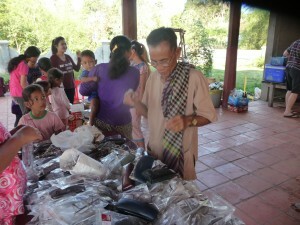 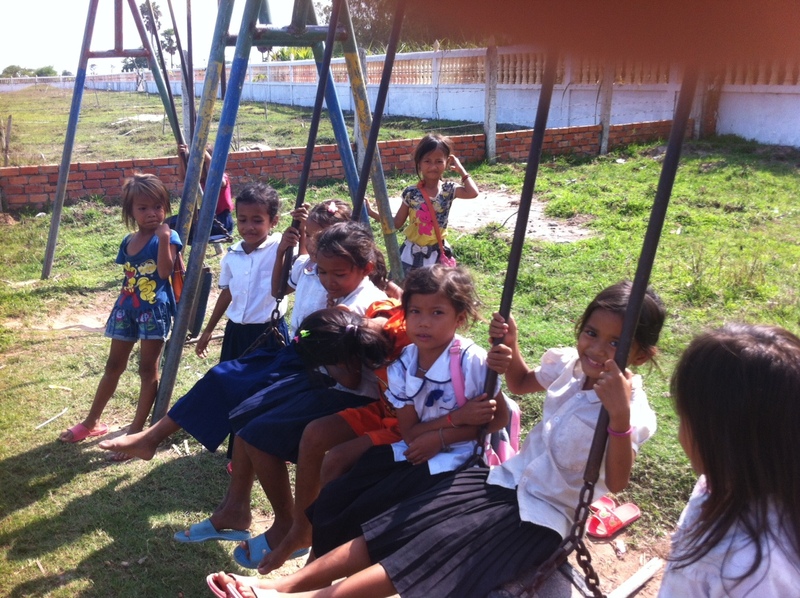 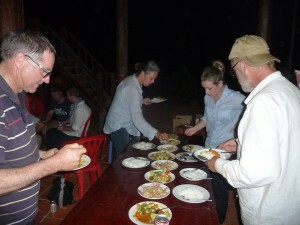 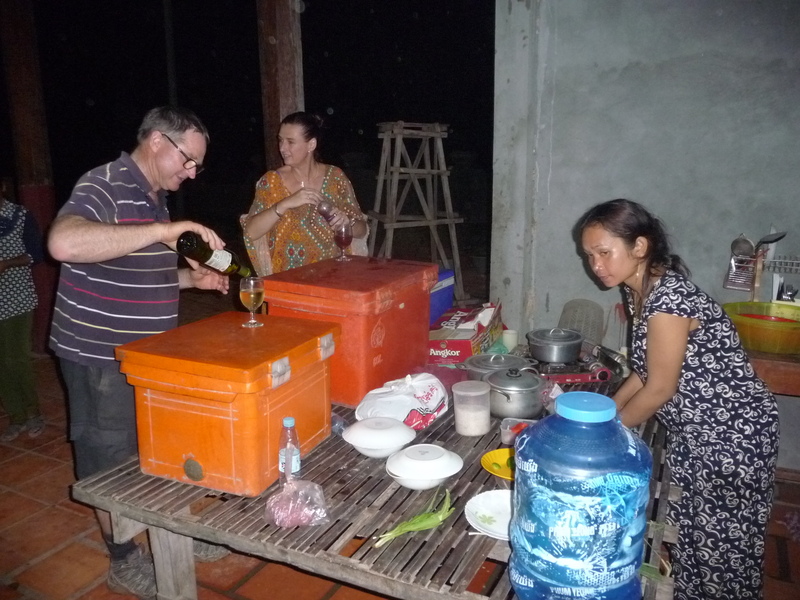 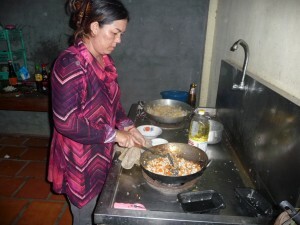 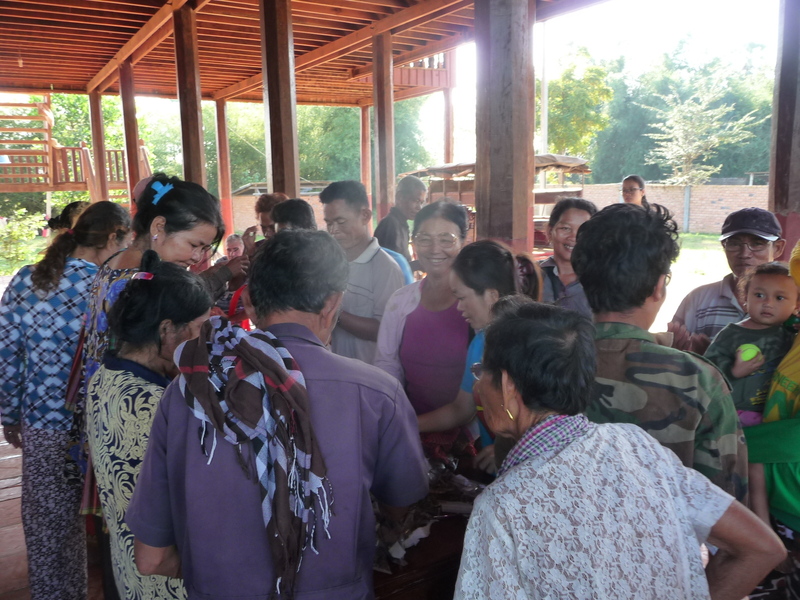 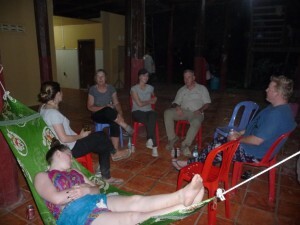 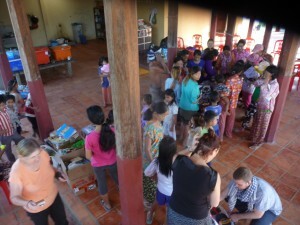 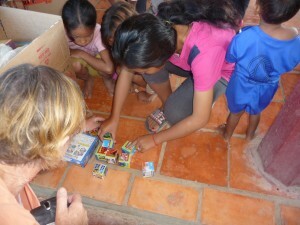 – The Wagga club http://www.helpcambodia.com.au is considering helping us in our villages. 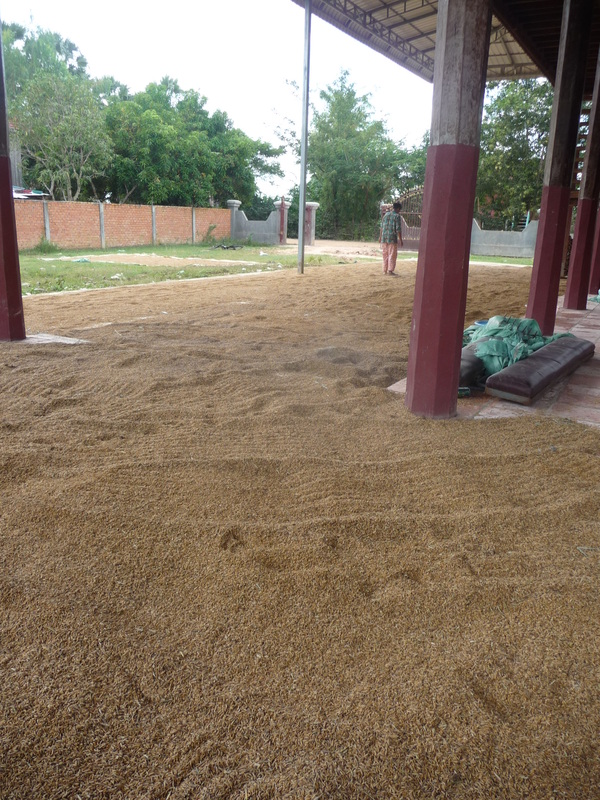 – The building would go across the end wall directly opposite the entrance gate and be exactly where the UNESCO swings are. 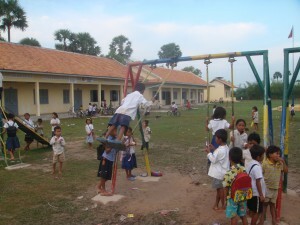 We will move and refurbish the swings and slide to the entrance end of the School. – The long low wall is not on any boundary which means there is as much room as we need for the new building. 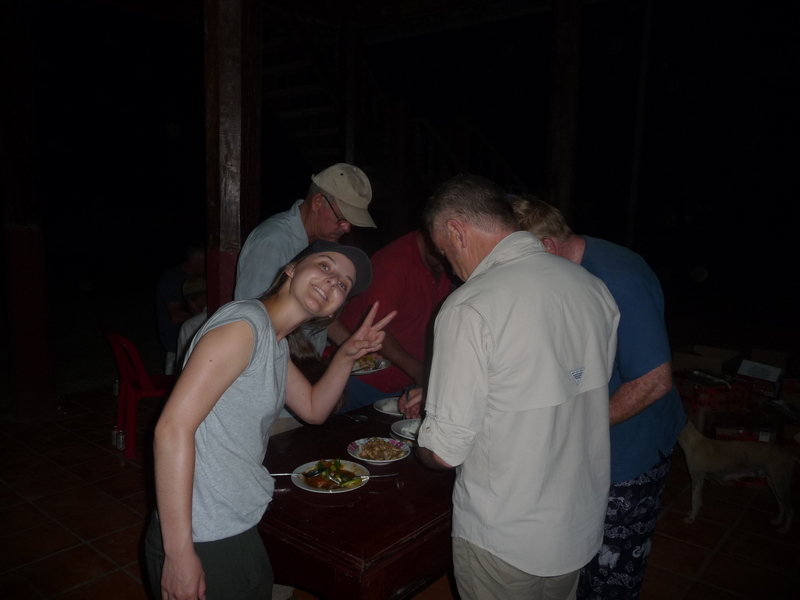 It’s evening and time for one of my favourite menu items – Chicken ginger stir fry with local herbs, spices and green – and yes it WAS enjoyed. 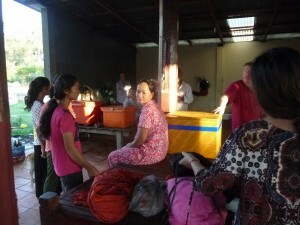 Sreymom came with the Wagga group as their Guide and was and is a very popular person. we prepared dinner for around thirty people. 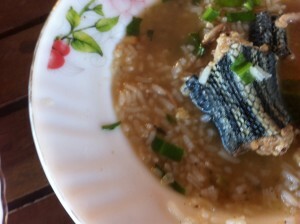 Chicken ginger with local herbs, spices and greens. and now a group of evening’photos. 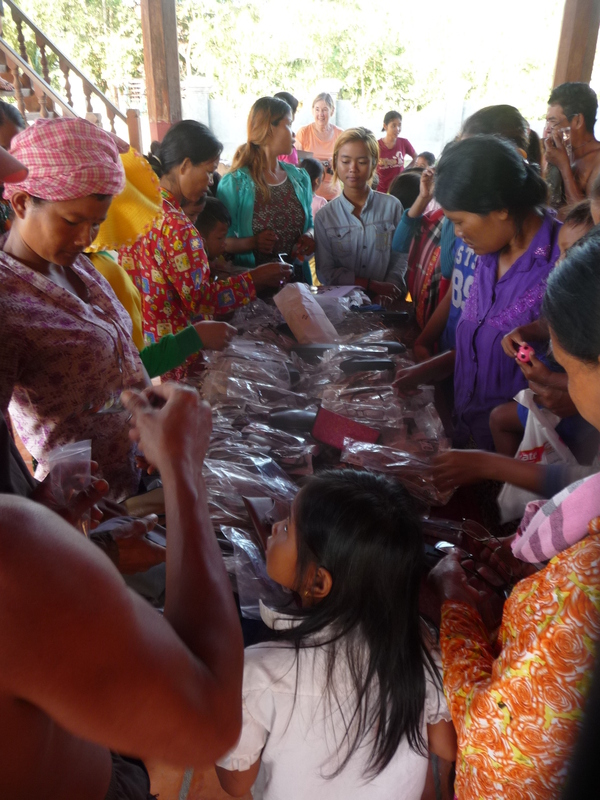 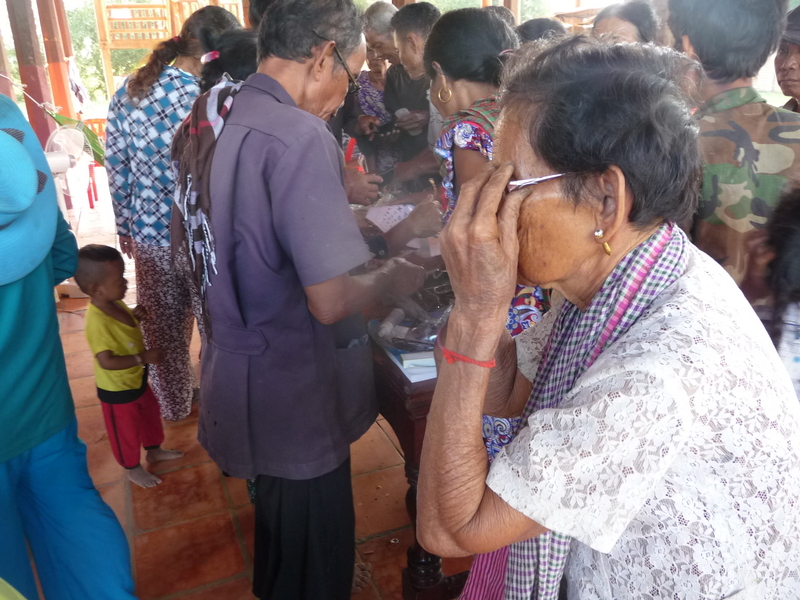 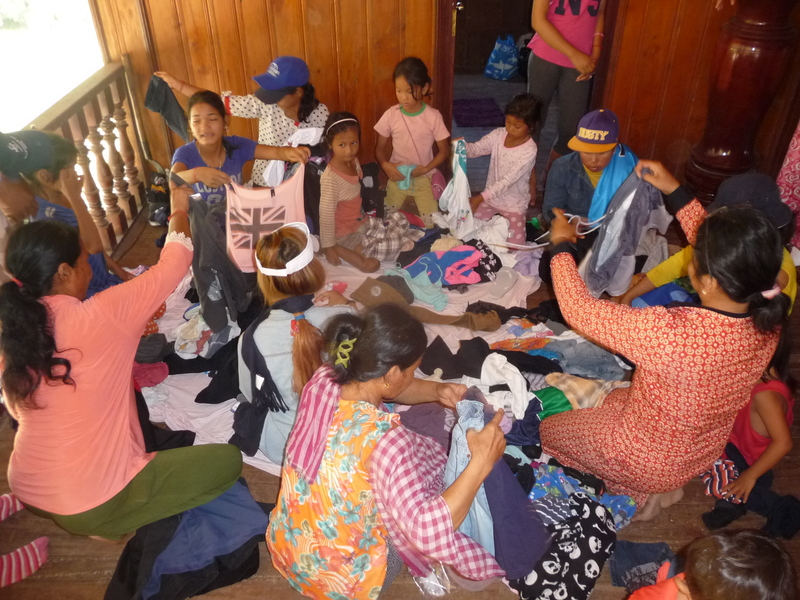 ‘HelpCambodia gave our children and families a huge quantity of clothes and just take a look at the GLASSES…. 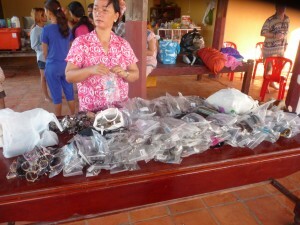 All these glasses from Wagga Wagga are new. 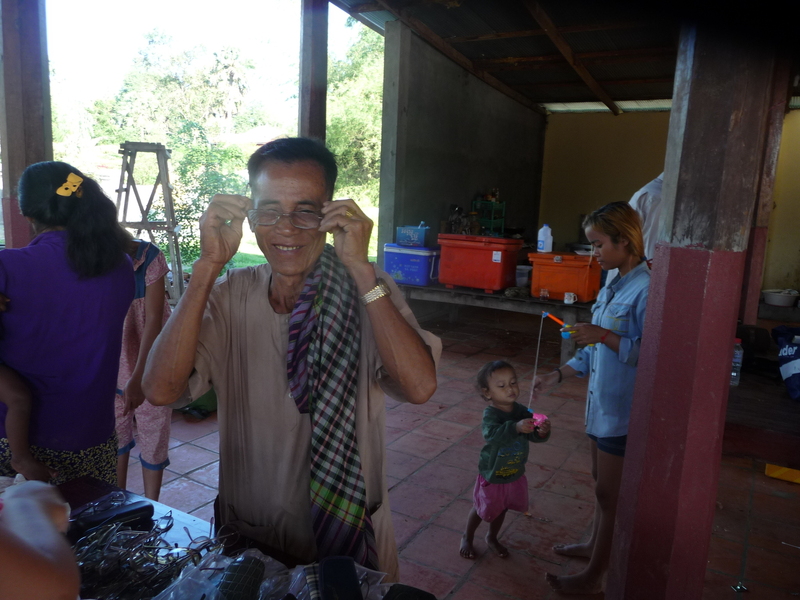 We have spent the past week going from village to village for people who have never had glasses before to try them on. REMEMBER that as yet medical care in our District is certainly among the worst in Cambodia and we officially have the six poorest villages nationally. 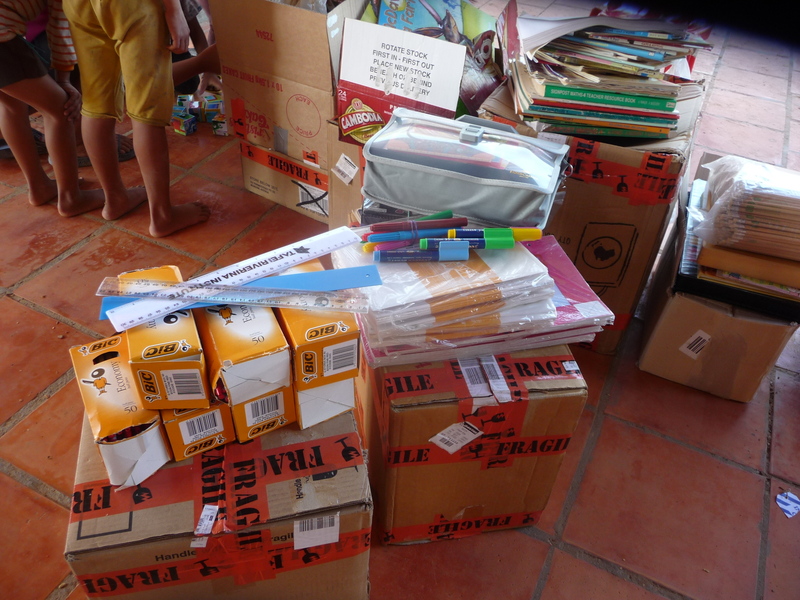 cartons and packages of exercise books and reading books were given to SokKen our head teacher for distribution and safe keeping. 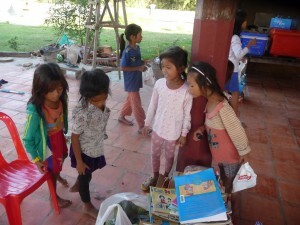 Sokken is a brilliant Head teacher. 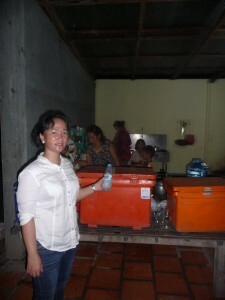 There are photos of her through this website and later on down today’s posting. 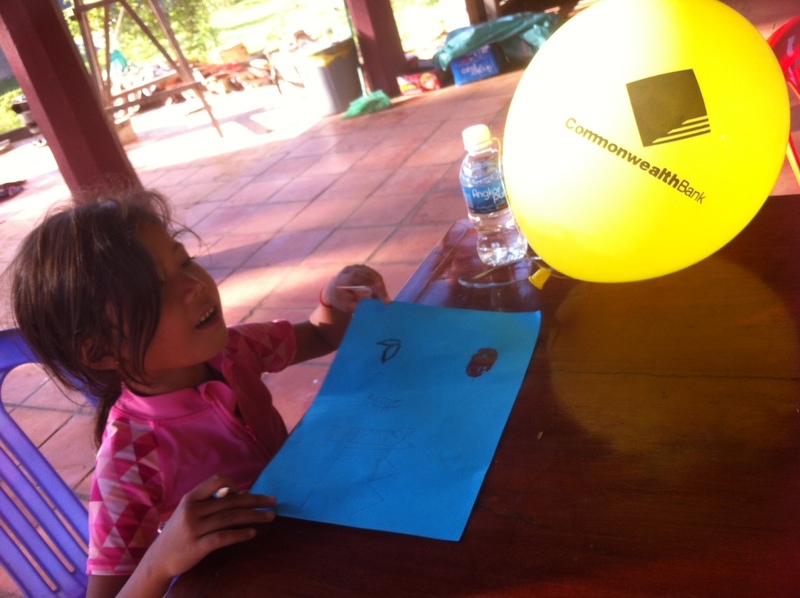 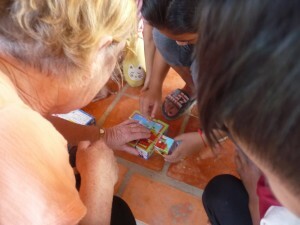 .One of our Wagga HelpCambodia friends showing one of the children about puzzles. Lots of sporting and playthings. 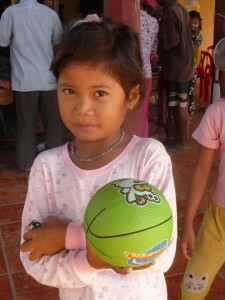 This is Nang’s daughter Peery with one of the balls. There’s a great photo of Peery later down the page with a balloon and drawing. older members of families who have NEVER BEFORE tried on a pair of glasses – incredible stuff. 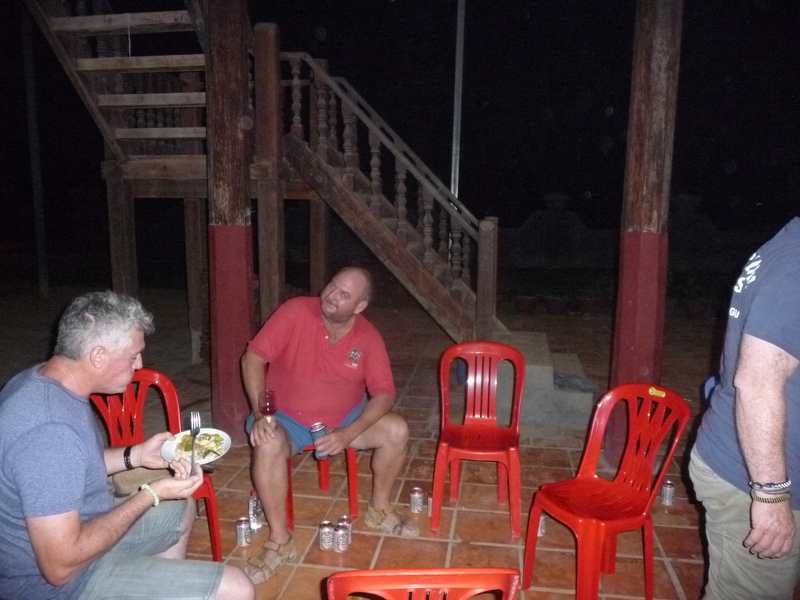 We have always had police security within the Guesthouse. 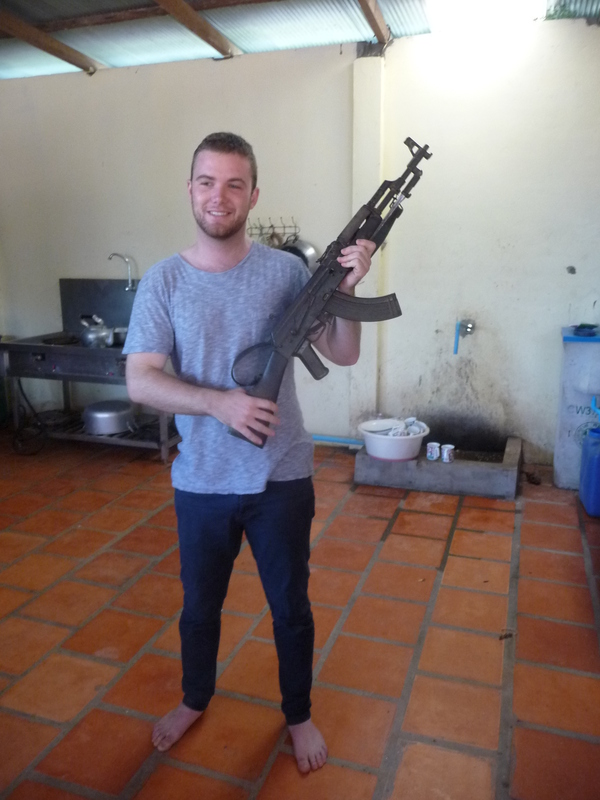 One of our truly good policemen took the ammunition out of his gun to let this member of the amazing visitors pose with his gun. 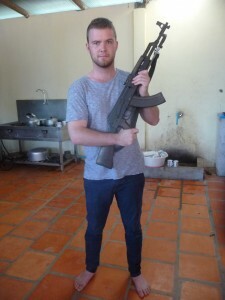 Why do we need security? 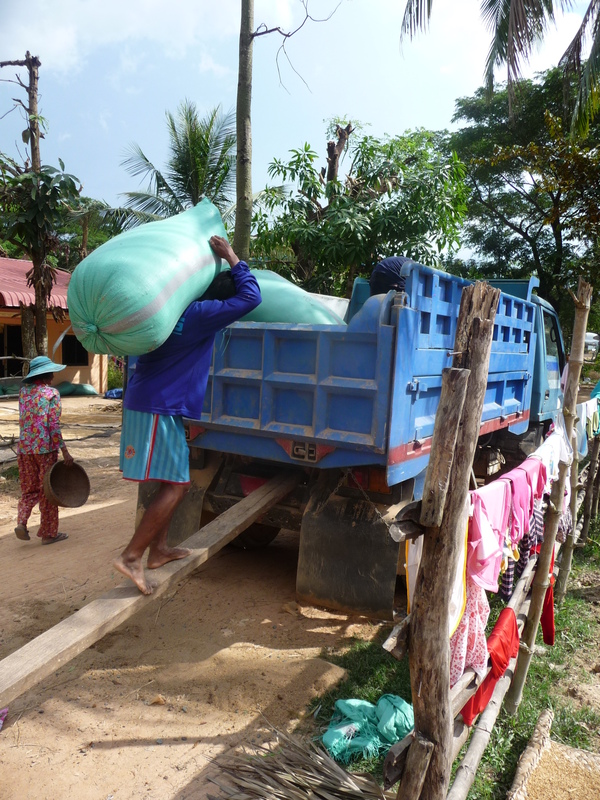 our villages are in a heavily populated remote and dirt poor region. 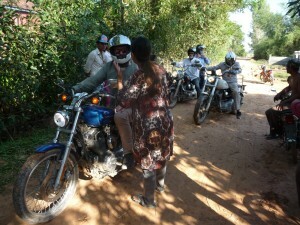 The Cambodian Government requires that we pay for police security when any foreigners are in our villages. out of sequence but internet is soooo weak I’m not going to move ‘Chris with children!! on the Guesthouse balcony sorting through donated clothes.. I LOVE THIS PHOTO. getting the upper floor ready for mattresses. 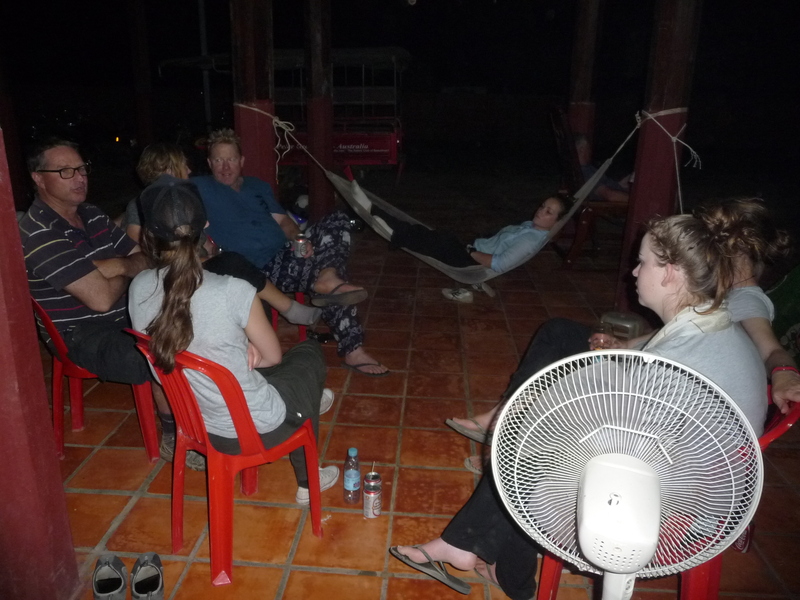 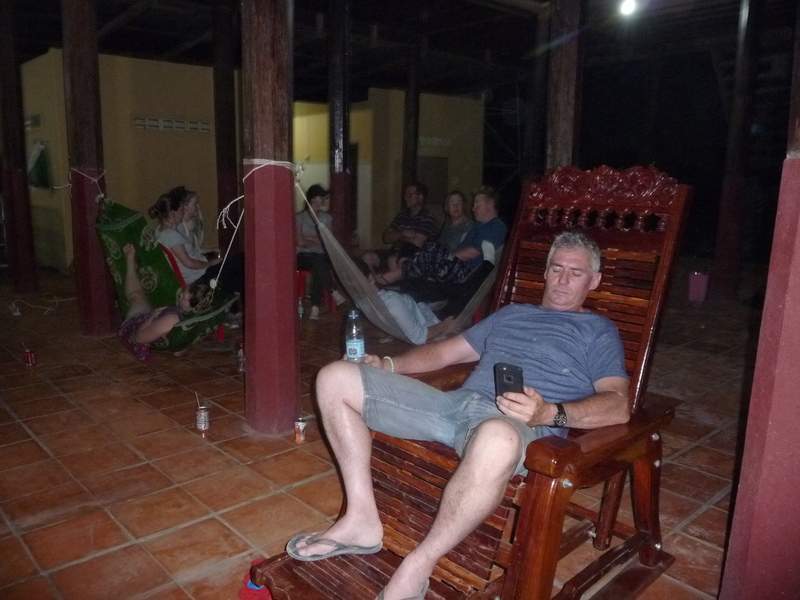 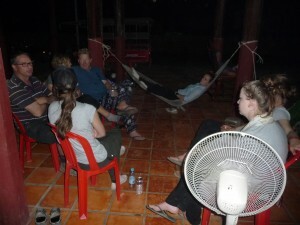 We eventually comfortably slept 30 people that night and even a couple of the men who preferred hammocks downstairs had mosquito nets. 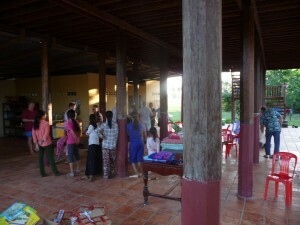 preparing to leave the following morning. 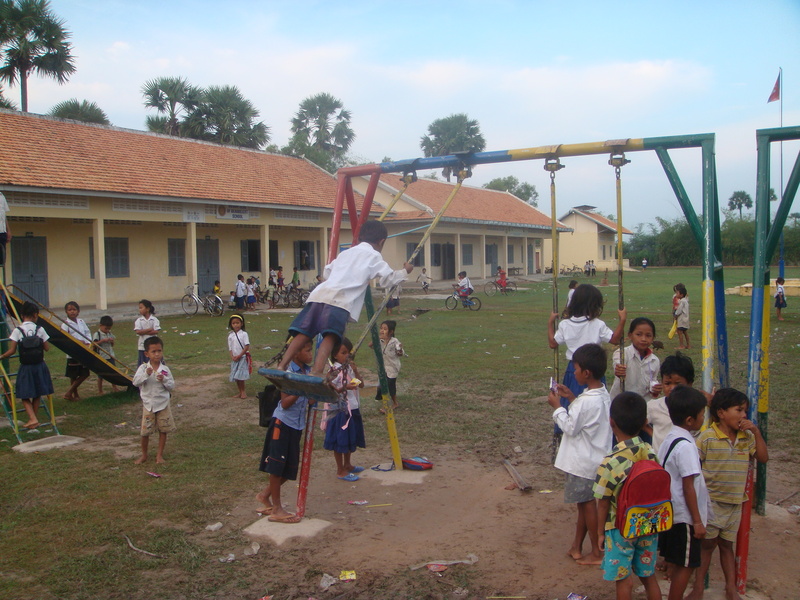 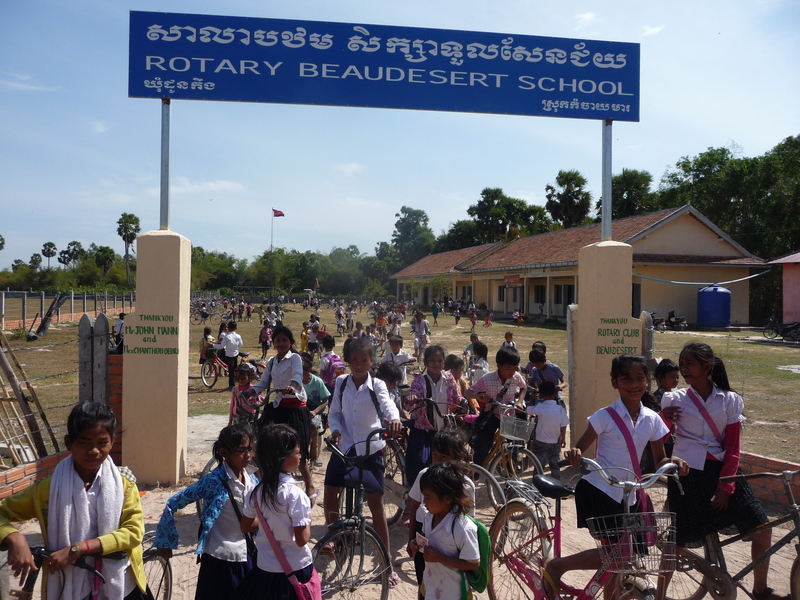 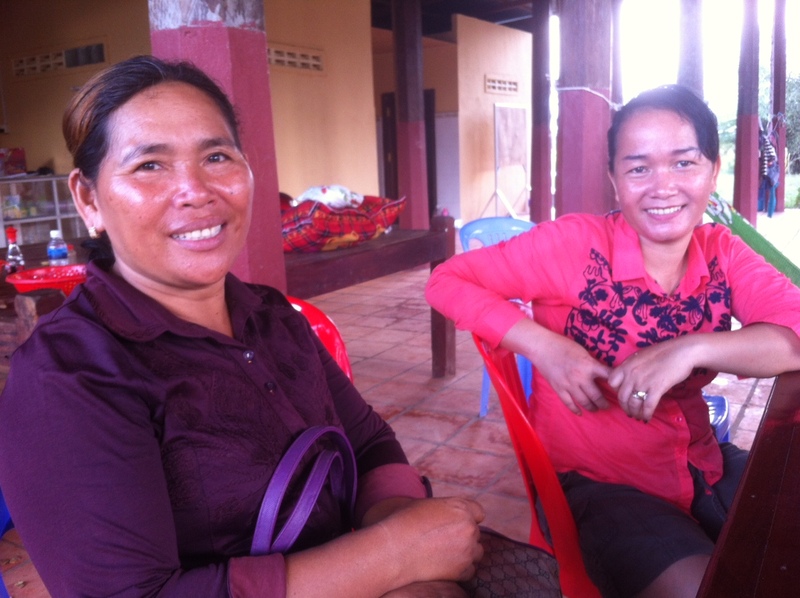 .With or without the extra three room building, The Cambodian Government is sending us three extra teachers to help our children. 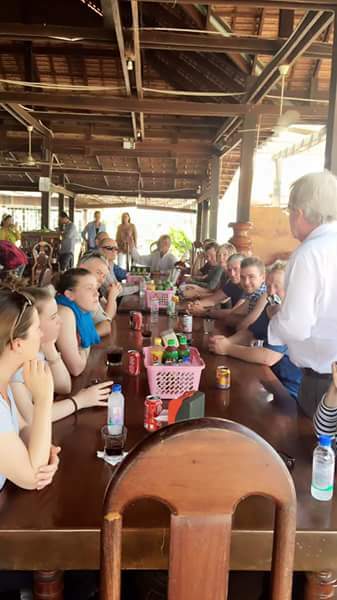 The Government will pay the US$2.50 per day and we pay a ‘salary supplement’ of US$1 because we are ‘so extremely remote and disadvantaged’.. one of those teachers starts in December, the other two in January. 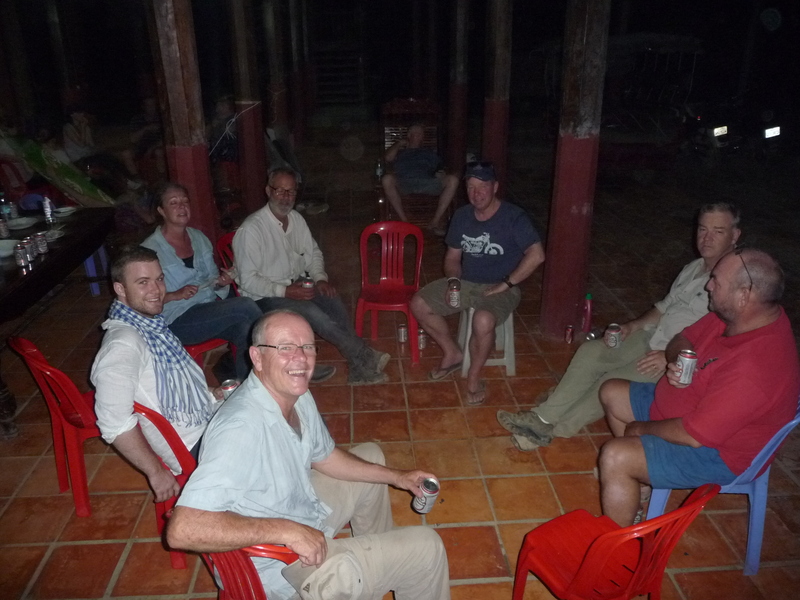 The Wagga guys have handed me US$366 to cover one of the extra teachers for a year. Thankyou. THIS NEXT SECTION IS LATER THAT DAY. LIFE CARRIES ON IN THE VILLAGES. 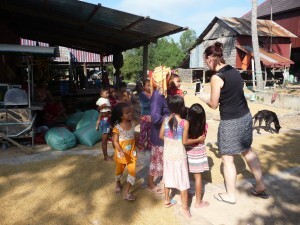 She loved the Wagga group. 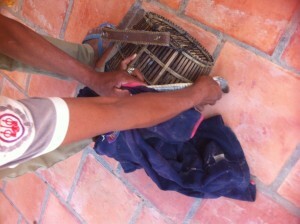 “pros laor.. Srey laor” Good men. Good women. Help Cambodia – Wagga pulled out all the stops. Wagga Commonwealth Bank donated stationery and pencils. 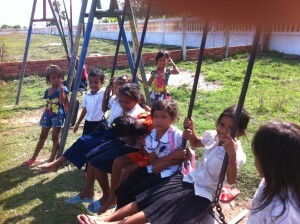 The school has them all except for Peery and her balloon and a pen. The group left early morning on November 15. 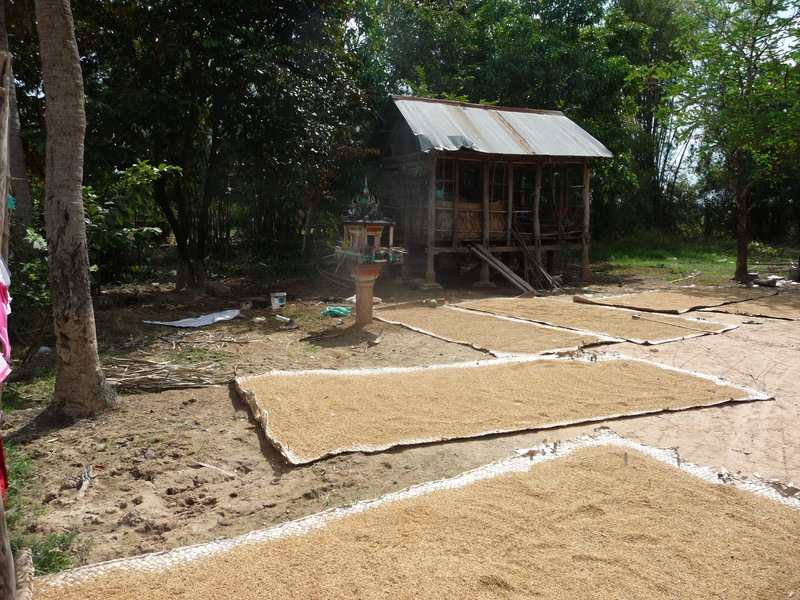 By midday the entire ground floor was covered by drying rice from five families. Flat, dry and protected – an ideal place for drying the harvest for three days before on selling. The one crop of the year. 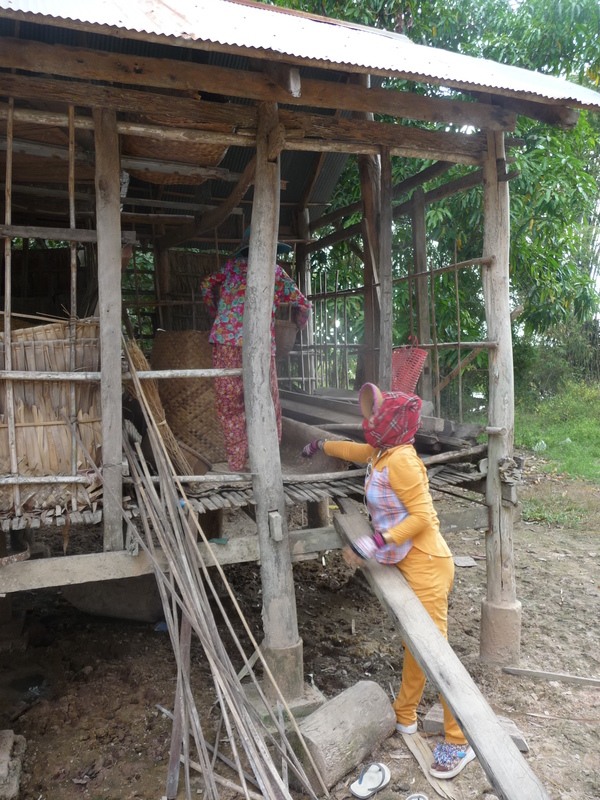 rice drying in every village household. 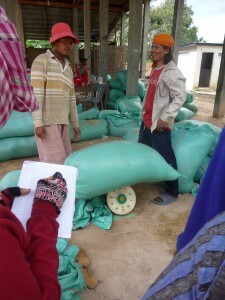 The rice is then put into bags and will each weigh about 80kg. Each bag is weighed by the buyer and the household. 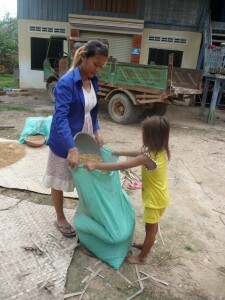 The Family is paid $16 for an 80 kg sack of rice…. 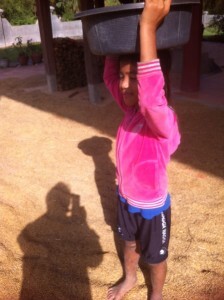 YES $16 for 80kg. 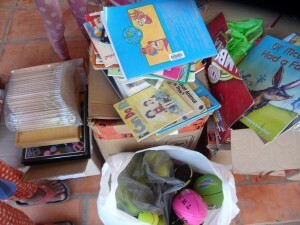 and on to the next part of the journey to our supermarket shelves. Families store a years supply of rice for their own use. 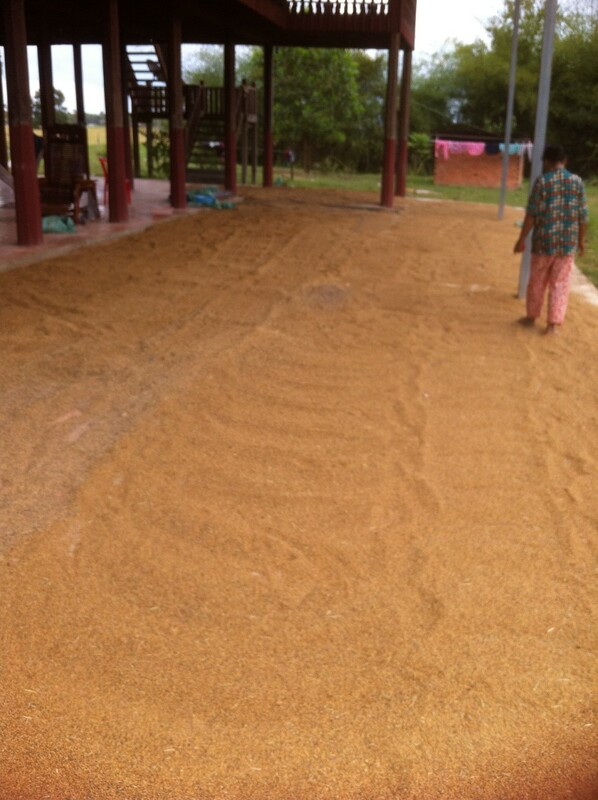 The rice straw is stored for animal feed.. 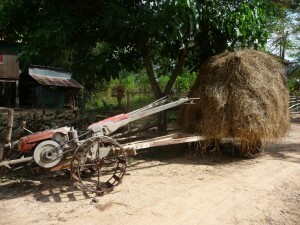 The Rotary Club of Beaudesert bought the Rotary Hoe for village use. A great purchase. 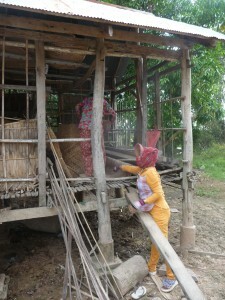 The village families can’t afford good supermarket chicken. we could not possibly offer village chicken to visitors. the villages love snake and small fish. 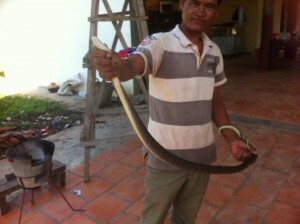 The ricefields attract mice which attract very fast mice catching snakes. 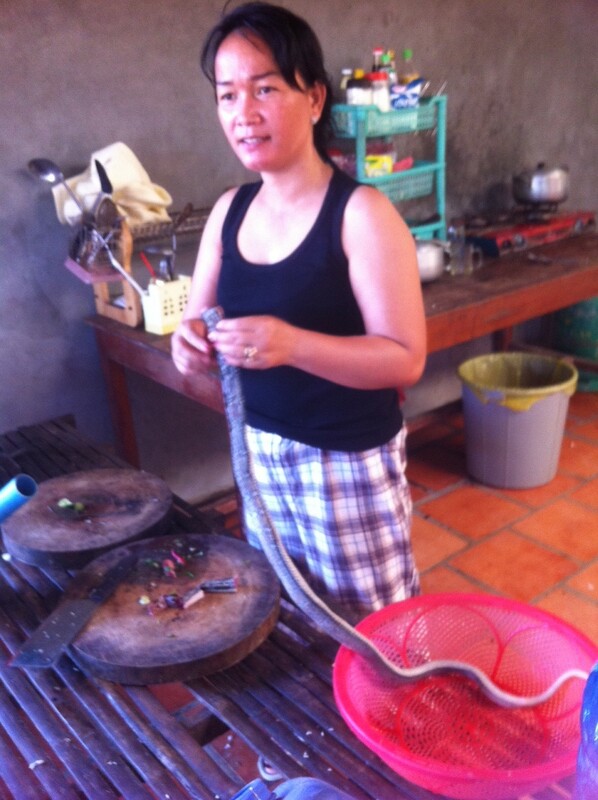 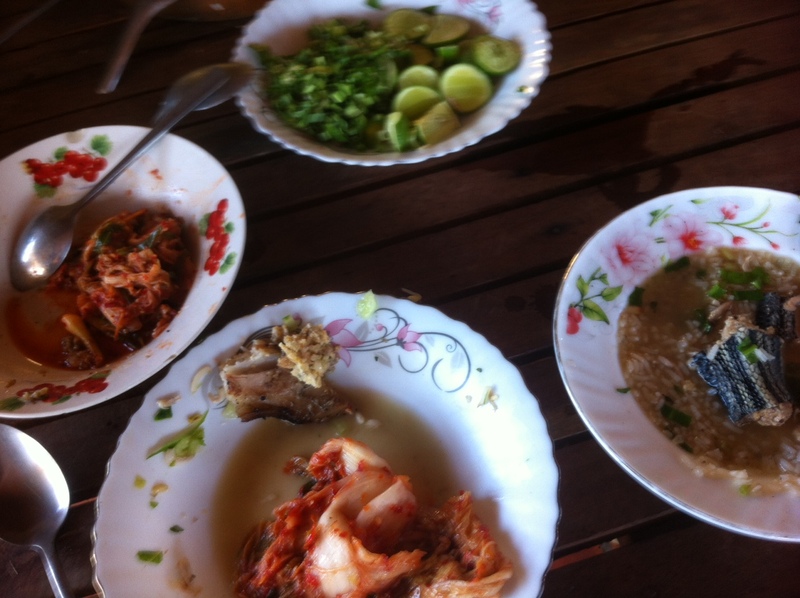 The families set traps This meal contains local herbs and spices and the snake…. 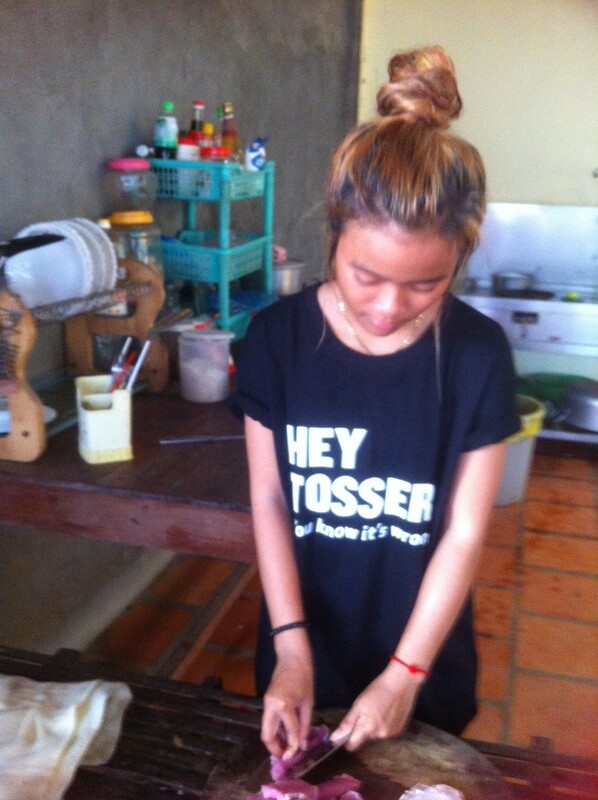 it tastes like chicken!. The Water Festival school holiday ended at the weekend and before I left the village to find internet for three days.. some children came by to say ‘hello’ at 6am on their way to the school morning shift.